KING of Luwu had a very beautiful daughter. Her name was Princess Tandampalik. She was very beautiful. Any man who saw her would fall in love with her. Everybody knew about her beauty, including King of Bone. Bone was a kingdom that was far away from Luwu Kingdom. Then, King of Bone paid a visit to Luwu in order to propose Princess Tandampalik to be her daughter in-law. His son, Prince of Bone, was still single. King of Luwu actually did not want to accept the proposal. According to the culture, he could not have a son-in-law who lived very far from him. Otherwise, he would suffer from terrible diseases. But, he knew if he refused it, kingdom of Bone would attack Luwu. Many of his people would suffer. After that, King of Bone came to Luwu and talked about the marriage proposal. King of Luwu said he needed time to decide. King of Bone understood and went home. Suddenly, a bad thing happened. Princess Tandampalik was ill. She got skin rash. The kingdom healer said the disease could infect others. The king then decided to put the princess in a safe place. It was on a remote island named Wajo Island. The princess was not alone. Some soldiers accompanied her. The princess was sad. But she knew if she stayed in the kingdom, many people would be infected. So she was not angry with her father for making her stay in a remote island. Several days after Princess Tandampalik lived in Wajo Island, a cow came to her. The cow was different from other cows. The skin was albino. 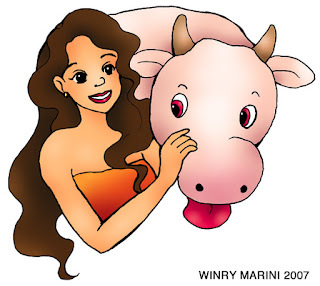 The cow licked Princess Tandampalik's skin. Amazingly, the disease was cured. Her skin was smooth again. Her beauty was back! In the meantime, Prince of Bone was sailing in the sea. He landed on Wajo Island. He was so surprised to see a very beautiful girl lived in such a remote island. "Wow, maybe she is an angel," he thought. "Who are you, beautiful girl? Do you live here?" asked Prince of Bone. Belum ada komentar untuk "Princess Tandampalik"